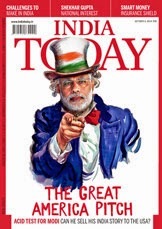 The following article - a preview of Indian Prime Minister's Narendra Modi's visit to the United States - was originally published by India Today on September 25, 2014. He is expected to participate in several high-profile events and meetings with US political and business leaders and members of the Indian-American community. Although the deliverables from such visits will be negotiated until the very last minute, the symbolism of Modi's engagements will be significant too. Observers of the Indo-US relationship should watch out for a few things during Modi's visit. First, it is impossible to overstate the significance of Modi's arrival for the Indian-American community. He has had, for years, an ardent following among NRIs and Indian-Americans. Several of them contributed in various ways to his prime ministerial campaign. His other support base in the US beyond Indian professionals has been the Gujarati community. For many years, Gujarati community functions in the US featured an empty chair, a symbol of wistful longing for the then-CM to be admitted to the country. Hence, the visit now marks Modi's triumph for many of his supporters. The event for the Indian community at New York's famed Madison Square Garden-itself an audacious undertaking has been oversubscribed. By one count, over 14,000 people signed up for the last 1,000 available seats. The event has been a massive logistical undertaking. Modi's Madison Square Garden speech will possibly be the highlight of the visit for many of the PM's US-based supporters. The second reason Modi's visit will be significant is the official welcome he will receive from the political establishment, led by President Barack Obama. For all the talk about American decline, an official invitation to the White House carries enormous international significance for any world leader. The Washington leg of the visit marks a bid by both countries to build bridges quickly, and the US government particularly the executive branch is keen to lay out the red carpet. In addition to the president, Modi is also expected to meet Vice President Joe Biden and leaders of the US Congress. It will also be interesting to see who Modi meets individually on the sidelines of the UN General Assembly meeting, political and business leaders in New York, and other senior officials in Washington. These private meetings should provide a clearer picture of his global engagement, as well as how he intends to shape relations with the US beyond the current administration in Washington. And, like Modi's visit to Japan and Chinese President Xi Jinping's visit to India, various other stops will no doubt be carefully selected. In keeping with Modi's emphasis on jump-starting India's economy, his meetings with business leaders in both New York and Washington will be crucial. The American private sector plays a much bigger role, compared with its counterparts in China and even Japan, in directing investment and transferring technology. Whether Modi can convince America Inc to increase its long-term investment in India will be something to watch out for. The emphasis on the private sector does not mean that the US government cannot play a crucial role in facilitating India's development. The agenda laid out by Modi over the past several months from the campaign trail to his Independence Day speech raises several areas for cooperation, including clean and renewable energy, skill development, sanitation, urbanisation and digital communication technologies. In line with Modi's emphasis on regional connectivity and security, joint cooperation in third countries is another area for India and the US to work together in. In terms of deliverables, what is not yet possible is also clear. The current environment- both globally and bilaterally is not conducive to ambitious government-to-government agreements on trade and investment. But beyond development, defence and counter-terrorism offer areas of greater potential convergence. A new bilateral defence framework agreement, following the one signed in 2005, is due soon. And while joint military exercises and defence sales have kept pace, other aspects of defence cooperation, notably joint production and R&D, offer largely unexplored possibilities. With shared concerns about the implications of Western military withdrawal from Afghanistan, we can also expect a signal of closer cooperation on counter-terrorism. Ultimately, this is only Prime Minister Modi's first visit to the US, one that is coming so early in his tenure. This is really about setting the tone for bilateral engagement. It will be an attempt at rejuvenating ties after both the US and India preoccupied with economic challenges at home following the global financial crisis have become more distracted and introverted. The heady days of early engagement between India and the United States from 1998 and 2008 may be hard to replicate, but a more ambitious, less acrimonious and revitalised Indo-US agenda is certainly possible. One of the biggest boosters of ties may well be the Prime Minister himself. When asked by CNN's Fareed Zakaria whether India and the US could forge a "genuinely strategic" partnership, Modi replied, "Bade confidence ke saath mein kehta hoon, 'yes'." ("With great confidence, I am saying, yes.") Such an unambiguously positive statement would have been difficult to imagine any time in the last decade. What a difference a year makes.